Looking for the perfect fit? 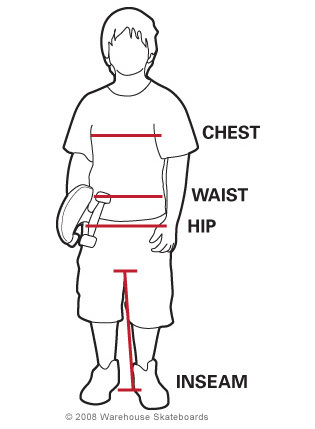 Be sure to select your size based on our fit guide tips below. In order to measure yourself properly, follow these measuring instructions for the best fit for you. Make sure you take into account that some youth clothing is made of cotton. These garments may shrink slightly after being placed in the wash. Chest: With your arms relaxed at your side, measure around the fullest part of your chest. Waist: Measure around your natural waistline, generally around your belly button or slightly under. To ensure a comfortable fit, do not pull your tape measure too tightly. Hips: Measure the widest part of your hips or seat. This area usually corresponds to the top of your legs. Inseam: Standing straight, measure from top inside of your leg to the floor. Chest 25" - 27" 28" - 30" 31" - 33" 34" - 35.5"
Height (in) 52" - 56" 56" - 58.5" 59" - 64" 64.5" - 66"
Hip 29" 30" 31" 32"
Inseam 25" - 26" 25" - 26.5" 25" - 27" 25" - 27.5"
Height (inches) 34.5" - 36.5" 36.5" - 38.5" 38.5" - 41.5" 41.5" - 43.5"